Price includes Translation, Individualized Design, Artistically and Professionally Hand Carving by our reputable artists. Traditional Seal Carving Zuan style. Li Style. Less used in chop. Cursive Style. More used in modern chop design. Printing Style. Mostly used for students in school and daily use. Good quality Green-Earth stone with natural marble like marks. It comes with a box. This type of stone is like Soap stone, but much hard and wont crumble to powder while carving. This size of stone can comfortably fit up to 4 characters. Email us your simple design. If you have a special request, please make sure to write it in the “Comments” box during the check out process. 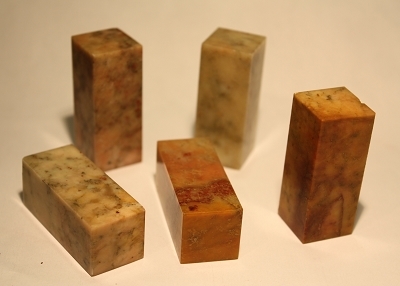 Stone Size: 3/4" x3/4" x 2" H.
Each stone could appear differently. Professional Ink Pad - Eight Treasure 20g.